The New Jersey medical cannabis industry celebrated a major milestone in December, when the state’s first dispensary officially opened its doors and began serving patients. Now, two months later, frustration has replaced jubilation for some professionals and patients. That first dispensary – Greenleaf Compassion Center – is still the only MMJ center in the state. None of the other five planned dispensaries appear even close to launching, and the next one might not open until summer – though even that is doubtful. Entrepreneurs say they have run into a host of challenges, including sluggish response times from the agency that oversees the MMJ program. So most of New Jersey’s 686 registered patients are flocking to Greenleaf for cannabis. That can be a nice problem to have from a business perspective: More patients equals more revenue and, often, higher prices. But it’s created a huge chasm between supply and demand. Greenleaf is struggling to keep up with the the avalanche of patients seeking medical marijuana, and some locals are having to wait up to two months to get an appointment. The dispensary also is reportedly asking patients to purchase up to a half-ounce of marijuana rather than the allowable two ounces to ensure there is enough to go around. In its initial application with the state, Greenleaf forecast that it would end its first year of business with 300 patients under its care. Those are the estimates the owners built the dispensary – and its cultivation operations – around. Its plan was to focus mainly on patients in the northern part of New Jersey. But there are more than twice that number of registered patients in New Jersey – with just one dispensary to serve them all. So Greenleaf finds itself handling patients from across the entire state. 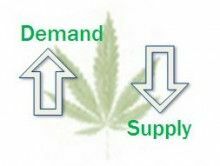 It’s extraordinarily difficult to scale up quickly to meet demand, given the time, space and resources needed to cultivate marijuana. New Jersey passed its medical marijuana law nearly three years ago, but it has largely been in a holding pattern since then as officials wrangled over the best way to regulate the emerging industry. The state is now facing a lawsuit by patients over these delays. The suit demands that the state speed up the dispensary approvals process and remove other barriers that have prevented centers from opening and patients from registering for the drug. 1 dispensary? in the i smell corruption in the state of nj. sht follow the money. What a ridiculous situation! We wouldn’t put up with this with alcohol and we shouldn’t put up with it with marijuana. It’s time to demand that marijuana be legalized like beer and wine!